When veteran broadcaster Sara Manobla represented Israel at an international conference of journalists in Moscow in 1977, little did she realize that her contact with the Jews of the Soviet Union would become the start of her own voyage of self-discovery. Her commitment to the cause of the refuseniks and her involvement with them once the gates of emigration opened and they arrived in Israel event… ually led to an exploration of her own family history. Together with her cousin, she embarked on a roots journey to Zagare, a little shtetl on the border between Lithuania and Latvia. Here she met Isaac Mendelssohn, the sole survivor of the town's Jewish community. 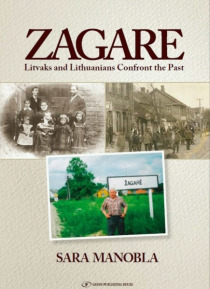 Unexpectedly, a meaningful and fruitful relationship developed between Isaac, a group of descendants and a group of local inhabitants, a relationship always shadowed by memories of the slaughter in 1941 of Zagare's Jewish population by Nazis and local Lithuanian collaborators. The culmination came in 2012 with a joint project of the two groups to erect and dedicate a memorial plaque in the center of the town. As part of her desire to accept Zagare, Sara Manobla followed up on the story of an elderly Jewish woman and her granddaughter who had been rescued and hidden by a Zagarean family during the Nazi occupation. She tracked down the granddaughter, now living in Jerusalem, and her testimony resulted in the Zagarean family being posthumously honored by Yad Vashem Holocaust Martyrs and Heroes Remembrance Authority as Righteous among the Nations. The book ends on a note of hope and reconciliation, as this account of a search for roots leads to a coming to terms with today s highly charged relationship between Lithuanians and Jews.